As soon as my sister told me about these, I was on a mission to find them. Pure bliss. I don't know how I ever survived the holiday season without these. They leave peppermint bark in a cloud of dust! 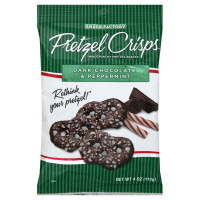 Snack Factory Pretzel Crisps, Dark Chocolate & Peppermint. I bought mine at CVS. They are also available at Wegmans.